The Hope College Great Performance Series will continue with Brentano String Quartet on Friday, Nov. 7, at 7:30 p.m. in Dimnent Memorial Chapel. The quartet will be performing the “String Quartet in B-flat major, KV 458 (Hunt),” by Wolfgang Amadeus Mozart; Bela Bartok’s “String Quartet No. 3 (1927)”; and “String Quartet in B-flat major, Op. 67,” by Johannes Brahms. Within a few years of its formation, the quartet garnered the first Cleveland Quartet Award and the Naumburg Chamber Music Award; and in 1996 the Chamber Music Society of Lincoln Center invited the quartet to be the inaugural members of Chamber Music Society Two, a program which has become a coveted distinction for chamber groups and individuals. The Brentano String Quartet recently concluded a 14-year residency at Princeton University and has recently been named Quartet in Residence at Yale University. The quartet has performed in the world’s most prestigious venues, including Carnegie Hall and Alice Tully Hall in New York; the Library of Congress in Washington; the Concertgebouw in Amsterdam; the Konzerthaus in Vienna; Suntory Hall in Tokyo; and the Sydney Opera House. The quartet had its first European tour in 1997, and was honored in the United Kingdom with the Royal Philharmonic Award for Most Outstanding Debut. In addition to its worldwide performances, the quartet has also released eight recordings. The quartet has recorded the “Opus 71 Quartets” of Haydn, and has also recorded a Mozart disc for Aeon Records, consisting of the “K. 464 Quartet” and the” K. 593 Quintet,” with violist Hsin-Yun Huang. In the area of newer music, the quartet has released a disc of the music of Steven Mackey on Albany Records, and has also recorded the music of Bruce Adolphe, Chou Wen-chung and Charles Wuorinen. The ensemble’s last two recordings have focused on the late quartets of Beethoven. 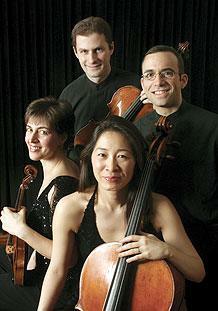 The Brentano String Quartet is comprised of Mark Steinberg (violin), Serena Canin (violin), Misha Amory (viola), and Nina Lee (cello).The Quartet is named for Antonie Brentano, whom many scholars consider to be Beethoven’s “Immortal Beloved,” the intended recipient of his famous love confession. Individual tickets for the Nov. 7 performance are $18 for regular admission, $13 for senior citizens, and $6 for children 18 and under. For the sixth consecutive year, ExxonMobil has provided support for high school students to learn about the natural and applied sciences as participants in the summer research program at Hope College. Hope College has named Jeff Puckett as its new vice president for development and alumni engagement.